Development of the nonwovens industry; Dry-laid web formation; Wet-laid formation; Polymer-laid web formation; Mechanical bonding; Thermal bonding; Chemical bonding; Chemical and mechanical finishing; Characterisation, testing and modelling of nonwoven fabrics. Nonwovens are a unique class of textile material formed from fibres that are bonded together through various means to form a coherent structure. Given their rapid industrial development and diverse markets, understanding and developing nonwovens is becoming increasingly important. With its distinguished editor and array of international contributors, the Handbook of nonwovens, offers a comprehensive review of the latest advances in this area and how they can be applied to particular products. Initial chapters review the development of the industry and the different classes of nonwoven material. The book then discusses methods of manufacture such as dry-laid, wet-laid and polymer-laid web formation. Other techniques analysed include mechanical, thermal and chemical bonding as well as chemical and mechanical finishing systems. The book concludes by assessing the characterisation, testing and modelling of nonwoven materials. 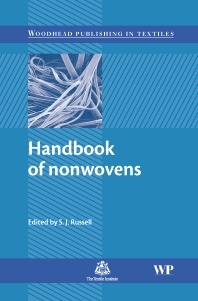 Handbook of nonwovens is a valuable reference for those involved in the manufacturing and use of nonwoven products in such areas as; transport, medicine, hygiene and various branches of engineering. Dr Stephen Russell is a Senior Lecturer in the Centre for Technical Textiles, University of Leeds and the Director of the Nonwovens Research Group (NRG), UK.